This week has been a busy one…. but an exciting one as it was finally time for Orientation, ready for me to start school again! The past few days have been full of meeting new people and filling out forms, learning new procedures……. I can’t wait to get started! 125g Smoked Spicy Cheddar, grated – I used this one, from Grafton Village, be warned… it is actually very spicy, I once used a whole block in something and made it almost inedible! 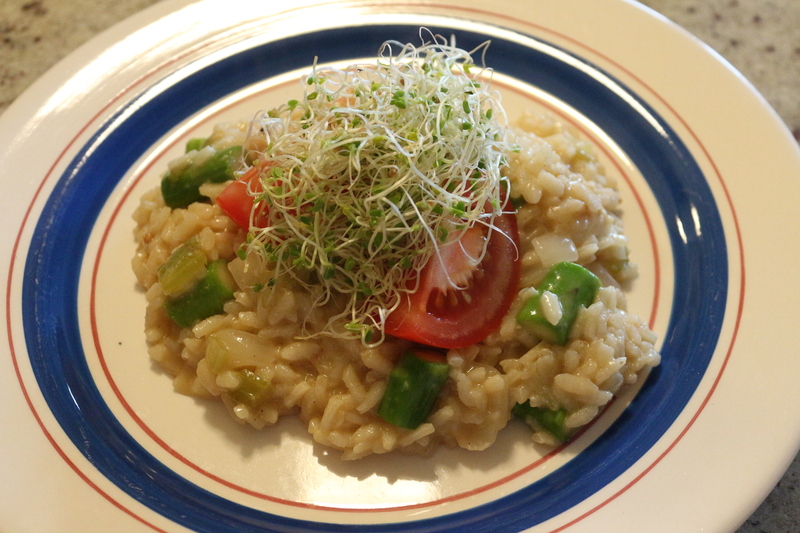 Also, I rarely can be bothered to grate it, so just cut it into small cubes and allow it to melt. Meanwhile, heat 25g (1oz) of the butter with the olive oil in a large saucepan (I used my saute pan), and add the onion, garlic, and celery. Stir and fry gently, with a lid on the pan, for 15 minutes or until they are tender but not browned. Stir often. Add the rice, stirring over the heat for 1-2 minutes, or until the rice looks glossy. Make up the stock in a pan and set it over a gentle heat to keep warm. Start to add the hot broth, a ladleful at a time, allowing each ladleful to be absorbed before adding the next, stirring well. On the second to last ladleful, add the chopped asparagus. Once all the broth has been added, add the remaining butter and cheese and stir well. Allow to stand for 2 minutes to allow it to become extra creamy. 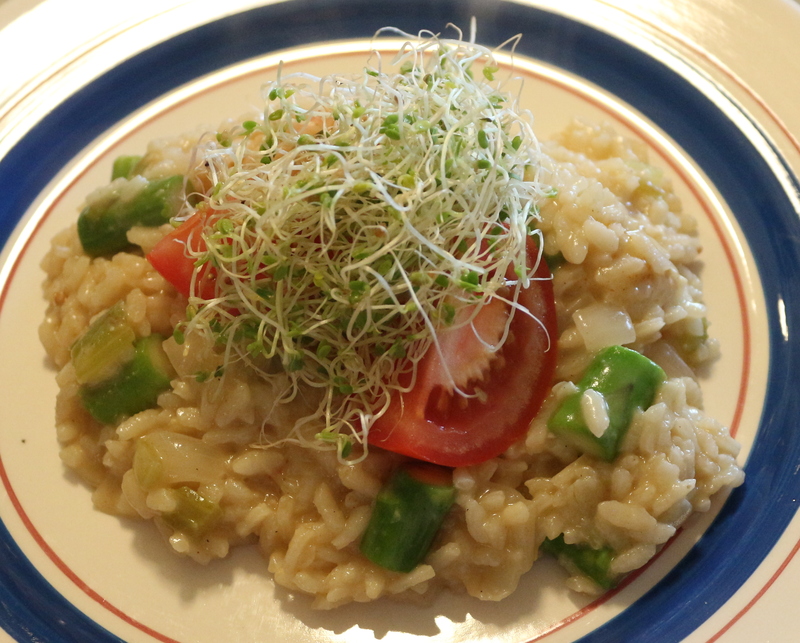 We had ours with some fresh tomato and red clover sprouts, the fresh crispiness of the sprouts perfectly balancing the creamy risotto. It was also of course time for another dose of bake off this week, dessert week = creme brulee, spanische windtorte, and cheesecake. For dinner we insisted on some reasonably healthy food (we still haven’t forgiven Brian for the Velveeta incident), so I made those good old tasty Easy Cheesy Lentils, with a load of frozen mixed veggies thrown in, and revisited another old recipe, adding a little twist. 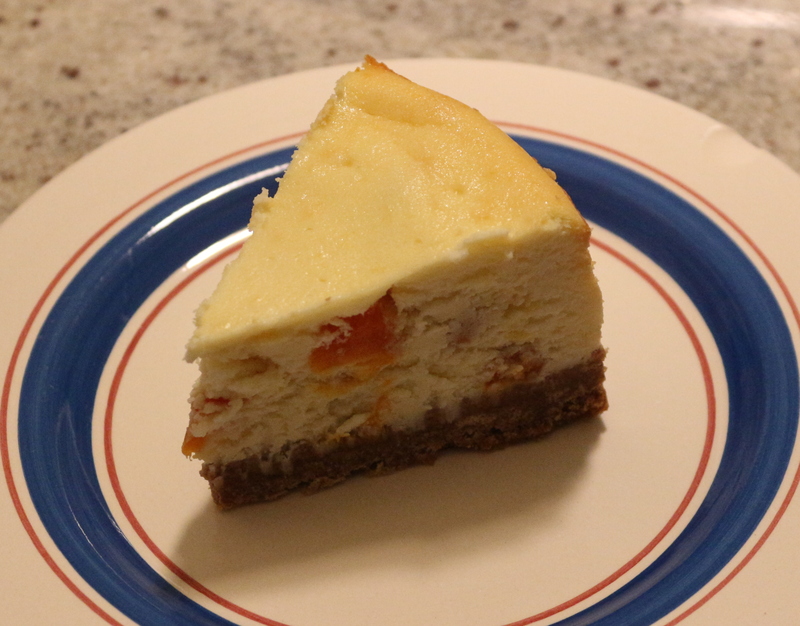 This is an Apricot, Honey, and Goat’s Cheesecake, based on Hugh Fearnley-Whittingstall’s Goat’s Cheesecake, with some chopped dried apricots incorporated into the cheese layer, and honey grahams in the base. Yum.